What exactly is community solar? It’s a new way to receive the money-saving benefits of rooftop solar, but much more simply. And, it helps ensure a better environment for future generations. The main difference from rooftop solar is this: instead of customers paying to place expensive panels on their roof, with community solar a group of households get together to support a centralized solar farm. It’s available to many renters and homeowners who can’t get, or don’t want, rooftop solar for various reasons. Community solar also supports the development of the clean energy industry in the regions where they’re located, including creating jobs. According to a new study conducted by the Smart Electric Power Alliance (SEPA) and the Coalition for Community Solar Access (CCSA), community solar capacity more than doubled in the United States between 2016 and 2017. Currently, many states are considering legislation to allow for community solar, including Illinois, New Jersey, New Mexico, Nevada, and Pennsylvania. Not surprisingly, community solar is becoming more common as more people learn about all the good things it does for communities where the farms are located. New community solar projects are in the works in Maryland, Minnesota, New York, North Carolina, Nebraska, Pennsylvania, Vermont, and Texas. So far, Minnesota, Colorado, California, and Massachusetts are leading the nation for installed community solar projects. 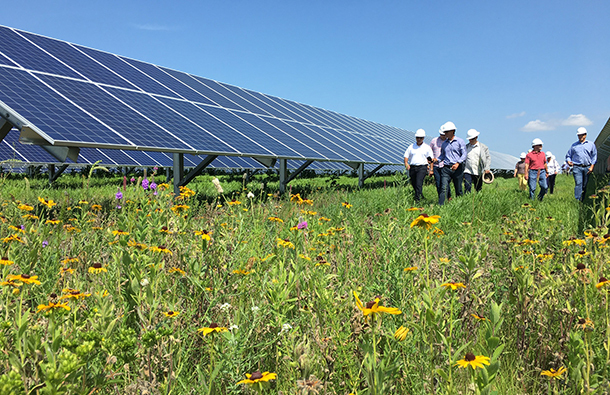 Landowners benefit from leasing land to community solar farms, too; often because their land is no longer suitable for growing agricultural products. Farmers are effectively paid to let land lie fallow, building back its nutrient stores for subsequent crops later. And the local flora and fauna can benefit, too. For some solar farms, fields under and around the solar arrays can be planted with pollinator-friendly plants and flowers. Feeding and protecting local pollinator species in this way protects native wildlife, and helps cultivate crop species growing there. We have a number of community solar projects under development, and we are evaluating additional suitable locations based on state rules, available sunlight, and other conditions. Qualified residents near to where the farms are built are eligible to become members. In fact, we partnered with OneEnergy Renewables to form BeeFriendly Solar, a Maryland based program dedicated to bringing residents in Anne Arundel County easier access to solar projects close to where they live. Our Maryland projects will allow interested residents to join the solar farm as members, which supports the operation of the farm. Typically, members’ electricity bills decrease, as energy generated by the farm will appear as a credit on monthly bills. We welcome Maryland residents to learn more and sign up for CleanChoice community solar if they're PEPCO utility customers or they're BGE utility customers. We also have community farms in New York, Massachusetts, Minnesota, and Washington, DC, which make solar energy available to apartment dwellers, renters, and others who aren’t able to install solar on their roofs. The strength of community solar is its versatility and multitude of benefits for so many. By creating access to emission-free solar energy, and helping both farmers and wildlife, community solar is a welcome, viable solution for a more sustainable future. That’s why we’re planning on offering more CleanChoice community solar in other states, too—there’s a growing demand for it by consumers who want energy choice.